In 1996, Natural Innovations, Inc., its president William S. Gandee, D.C., of Akron, Ohio, agreed to settle Federal Trade Commission (FTC) charges stemming from the advertising and sale of "The Stimulator," an alleged pain-relief device widely advertised in an infomercial titled "Saying No To Pain." According to the FTC, the infomercial made unsubstantiated claims that the device would relieve virtually all types of pain and provided immediate, long-term pain relief superior to that of medications and other treatments. The consent agreement requires Gandee and his company to have scientific proof to back up any health or medical-benefit claim they make in the future. It also requires them to be able to substantiate any claim that an endorsement or testimonial they use represents the typical experience of users, or to accompany such a claim with a prominent disclaimer. World Media T.V., Inc., which made the infomercial, signed a separate but similar agreement. 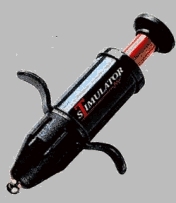 The Stimulator, which sold for about $80, is essentially a barbecue igniter outfitted with finger grips. Its marketers claimed it could relieve migraine headaches, other headaches, back pain, arthritis, stress, menstrual cramps, earaches, sinus, nosebleeds, flu and other ailments. Users were instructed to "touch the tip . . . to the general area in which you feel pain" and depress a plunger to generate electric sparks. As I work with the Stimulator, it is very obvious to me that soon this product will be worldwide. I believe that every household in America very soon will own a Stimulator. It might even go to the point where each individual person in the household will own a Stimulator because they'll want to keep it with them all the time. I also sincerely believe that the Stimulator will help you lead a more active, productive, and pain-free life. And as you share the Stimulator with your family and friends, which I hope you do and soon, I know that your family and friends are going to be calling you "Doc" or they're going to be asking for you to use the Stimulator on them. Use of the device will significantly reduce, relieve, or eliminate musculoskeletal pain, including but not limited to pain in the back, feet, knees, wrists, knuckles, elbows, shoulders, ankles, joints, or calves; carpal tunnel syndrome; muscle spasms or strains; or sciatica. Use of the device will significantly reduce, relieve, or eliminate abdominal pain or pain or discomfort caused by allergies, sinus conditions, diverticulosis, cramps, or menstrual cramps. Use of the device will eliminate the pain caused by severe headaches, including but not limited to occipital, frontal, migraine, cluster, or stress headaches, or headaches caused by benign tumors. Pain relief or pain elimination provided by the device is immediate. Use of the device provides long-term pain relief. For pain relief, the device is as effective as, or more effective than, prescription or over-the-counter medications, including but not limited to aspirin, acetaminophen, Darvon, Darvocet, or codeine. For pain relief, the device is as effective as, or more effective than, physical therapy, massage therapy, chiropractic treatment, acupuncture, acupressure, or reflexology. In May 1995, the FDA seized thousands of Stimulators marketed by Universal Management Services, Inc., of Akron, Ohio. In December, 1995, at the FDA's request, the U.S. Justice Department sought an injunction against this company. In December 1997, the District Court for the Northern Division of Ohio issued a permanent injunction halting the manufacture and sale of the device and ordering Universal Management Services to offer full refunds to each person who purchased one after May 1995. In September 1999, the United States Court of Appeals for the Sixth Circuit upheld the district court's ruling. This article was posted on December 27, 1999.